The Chinese dragon and the rooster have differences that will complement each other. The dragon is passionate and enthusiastic. They will be led by their instincts. They will appreciate a cozy home to come home to at the end of the day. The rooster is detail oriented and has a traditional style. In a dragon rooster marriage their house will be pristine and nicely decorated. They work very well together in all aspects of love compatibility. The dragon and rooster relationship will be affectionate because their differences will complement each other. When they are dating, they will have a good time with each other. When the male or female dragon get too excited, the male or female rooster will be able to bring them back down. Both the dragon and the rooster in love will be happy if they can both agree on what aspect of the relationship each will control. They are both equally very smart. The Dragons will be very passionate. They will have a kind heart and adore a devoted partner. They have a lot of initiative. At the same time, the Chinese rooster astrology sign is a perfectionist and will enjoy a night out of the house. They are meticulous and traditional and will depend more on planning. The rooster man is demanding. The dragon woman will not like this and it will likely make them angry. At the same time, the rooster woman is a very loyal and affectionate partner. The dragon man will be able to appreciate this. The dragon and the rooster friendship will be more successful if they try not to compete with each other. They will need to disregard what they see as each other’s less positive traits. They both need to remember to keep things fair in their relationship. The rooster will have to work at not being too critical of the dragon. The dragon will have to work at being more patient with the rooster when they are critical. Otherwise be ready for a breakup! In bed, the dragon and the rooster can have a relationship that is very sexually intimate. They might have some challenges though when it comes to marriage compatibility. The rooster has high standards and will be somewhat blunt when they are critical. The dragon has the capability of keeping their concentration and not being affected by their partner’s criticisms. If the dragon and rooster soulmates learn to accept and tolerate each other, the relationship will be more successful. They both will need to learn how to work together to make their relationship as successful as they can. The dragon rooster love match has the potential to be very happy together. 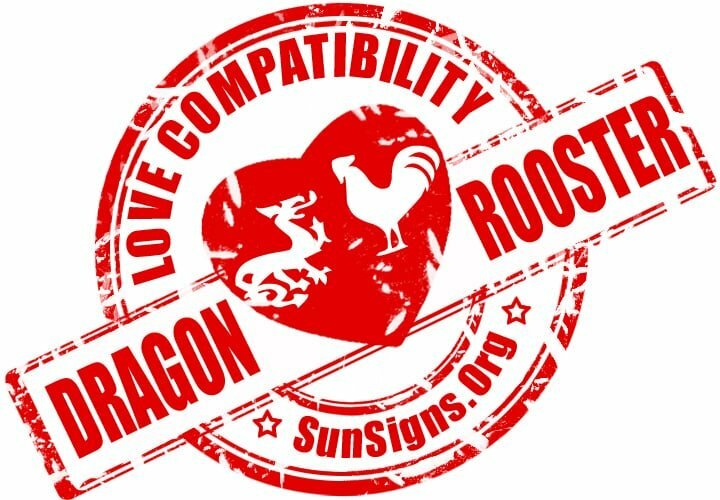 Dragon & Rooster Chinese Horoscope Compatibility Rated 3 Hearts!